Compassionate individuals interested in education can find meaning and purpose in the special education field. With competitive pay and a growth-rate projection that mirrors the national average, becoming a special education teacher is an worthwhile option for many professionals. Students who earn an online Ed.D. in special education or a Ph.D. in special education online can pursue teaching at the K-12 levels, or become administrators, professors, or consultants. Additionally, with a growing need for teachers -- especially special education teachers -- in the news nationwide, students who pursue a Ph.D. in special education online can ensure they will be part of the solution. Furthermore, those who become professors -- a career the Bureau of Labor Statistics (BLS) projects will grow 15% over the next 10 years -- can prepare the next generation of special education teachers for success. The following page breaks down what it takes to earn a doctorate in special education online. We discuss requirements, accreditation, employment, finances, and the best online programs in the field. What Else Can I Expect from an Online Doctorate in Special Education Program? Concordia University - Chicago ranks among The Best Online Special Education Doctorate Degree Programs! Concordia-Chicago students earning their doctorate in special education online choose between an Ed.D. and a Ph.D. The programs require 61 and 67 credits, respectively, and each curriculum includes a dissertation and a comprehensive exam. Curricula for both programs include classes in special education law and policy, current issues and trends in special education, and assistive technology for students with disabilities. Concordia-Chicago delivers online coursework asynchronously, and the online doctoral programs in special education require only one campus visit to complete a dissertation defense. Applicants must have earned a master's degree with a minimum 3.0 GPA. Applicants must submit MAT or GRE scores and a scholarly writing sample. Concordia University Chicago is regionally accredited by the Higher Learning Commission (HLC). The university's education programs are nationally accredited by the Council for the Accreditation of Educator Preparation. Drexel University ranks among The Best Online Special Education Doctorate Degree Programs! Based in Philadelphia, Drexel is a private research university that offers online bachelor's, master's, and doctoral degrees, including an Ed.D. in educational leadership and management with a concentration in special education leadership. The Ed.D. in special education requires 60.5-61.5 quarter credits and includes no campus visits. Learners complete coursework in school law and policy, instructional and curriculum leadership, and organization and administration. Drexel's quarter system allows students to complete the program quickly. The program is available in a part-time, cohort-based format that requires three years to complete, and in a one-course-per-term model that takes five years. Drexel delivers most online courses synchronously. Applicants must have earned a master's degree in education with a minimum 3.5 GPA and must have at least three years of relevant professional experience. Hampton University ranks among The Best Online Special Education Doctorate Degree Programs! Hampton U offers an online Ph.D. in educational management with a concentration in special education. The accelerated curriculum comprises 66 credit hours and combines theory with leadership training. Each course lasts nine weeks, and most students complete the Ph.D. in special education online in 30 months. The curriculum includes a dissertation, an internship, and a comprehensive examination. To qualify for non-provisional admission, applicants must have an undergraduate GPA of at least 3.0 and a GRE score of at least 150. Applicants who do not meet these thresholds can earn provisional admission by submitting a writing sample. Provisionally admitted students must earn at least a 3.0 GPA during their first six credit hours. Program officials interview each qualifying applicant. Hampton University is regionally accredited by the Southern Association of Colleges and Schools Commission on Colleges (SACS). Hampton U's education programs hold national accreditation from the National Council for Accreditation of Teacher Education. 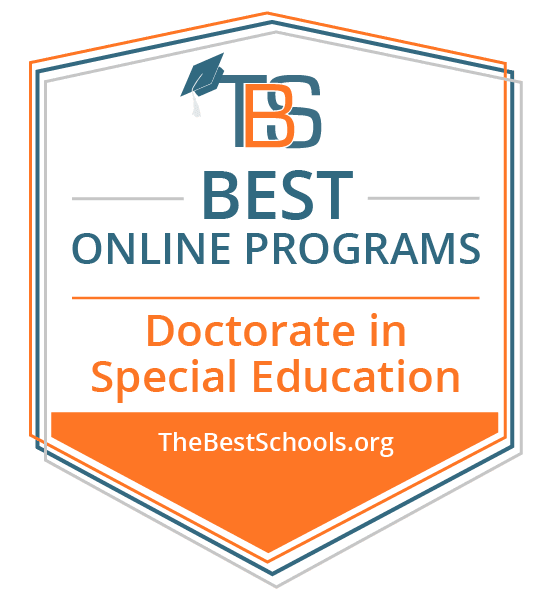 Liberty University Online ranks among The Best Online Special Education Doctorate Degree Programs! Liberty is a non-denominational Christian university that enrolls 110,000 students, many of whom study online. Liberty offers an online Ed.D. in special education with a flexible curriculum. The program requires 60 credit hours, and transfer students can apply up to 15 previous credit hours toward the degree. Liberty students in the Ed.D. program can apply up to 24 credit hours toward Liberty's Ed.S degree. Ed.D. students complete coursework in behavior management and education assessment for special needs children. The program culminates in a dissertation. Applicants must submit a statement of purpose and must be in the final six hours of a relevant master's program. Liberty University is regionally accredited by the Southern Association of Colleges and Schools Commission on Colleges (SACS). Liberty's education programs hold national accreditation from the National Council for Accreditation of Teacher Education. Regent University ranks among The Best Online Special Education Doctorate Degree Programs! Founded by celebrity minister Pat Robertson, Regent University offers a variety of distance learning programs from its Virginia Beach location. Regent's online Ph.D. in education with a concentration in special education requires 75 credits. Students earning the Ph.D. in special education online attend a four-day residency during each summer term. The curriculum includes courses in data analysis, the history of special education, and Christian worldview for educators. The program culminates in a dissertation. The program uses a cohort model and accepts students for the spring term. Applicants must have a master's degree in education and must submit transcripts and GRE scores. Program staff interview all qualifying applicants. Regent evaluates transfer credits on an individual basis, and transfer credits can comprise no more than 25% of degree requirements. Slippery Rock University ranks among The Best Online Special Education Doctorate Degree Programs! Based in Pennsylvania, SRU is a public university that offers exclusively graduate programs, including one of the most respected online doctoral programs in special education. The program combines synchronous and asynchronous online coursework during the fall and spring terms with face-to-face weekend courses during summer. The 60-credit curriculum comprises a research core, a leadership core, a special education core, and a dissertation. Students take classes including research methods for teacher leadership, instructional leadership, and positive classroom interventions. Applicants must have a bachelor's degree in a relevant field, such as elementary or special education, and a minimum 3.0 GPA. Applicants must also have earned a graduate degree with a minimum 3.5 GPA. Students can apply 12 master's credits toward the doctoral degree. Slippery Rock University is regionally accredited by the Middle States Commission on Higher Education (MSCHE). SRU's education programs hold national accreditation from the National Council for Accreditation of Teacher Education. Texas Tech University ranks among The Best Online Special Education Doctorate Degree Programs! Based in Lubbock, TTU offers a Ph.D. in special education online. The program requires 90 credit hours, and students may apply up to 30 transfer hours toward the degree. Students in the blended program complete the majority of required courses online in an asynchronous format. However, students must spend consecutive fall and spring terms on campus, in addition to portions of summer terms. The curriculum includes coursework in writing grant proposals, research, program evaluation, and leadership. Students complete standard doctoral requirements, including a qualifying examination, a dissertation, and an internship. Applicants must submit a resume, three letters of recommendation, and GRE scores. Texas Tech University is regionally accredited by the Southern Association of Colleges and Schools Commission on Colleges (SACS). University of Northern Colorado ranks among The Best Online Special Education Doctorate Degree Programs! Based in Greeley, UNC offers a flexible Ph.D. in special education. Students earning the doctorate in special education online complete coursework asynchronously and can enroll during any term. Most part-time students complete the 77 required credit hours in three to five years. The curriculum includes a dissertation, in addition to coursework in theories of exceptionality and statistical methods. Students complete a 180-hour externship related to exceptionalities. Applicants must have a combined GRE score of at least 297, a master's degree, and a minimum 3.0 GPA. Students must complete at least 40 doctoral credits through UNC. Though UNC is a state school, all online students pay a flat, per-credit tuition rate, regardless of state residency. The University of Northern Colorado is regionally accredited by the Higher Learning Commission (HLC). University of Toledo ranks among The Best Online Special Education Doctorate Degree Programs! The University of Toledo is a public research university based in Ohio. The university offers a Ph.D. in curriculum and instruction in special education. The 70-credit curriculum caters to part-time students and is ideal for working professionals. Students complete six credits per term and graduate in four to five years. The curriculum's defining feature is a virtual internship during which students complete professional experiences online through video conferencing and asynchronous work. The program's dissertation pairs students with faculty members, fostering research partnerships. Students meet with advisers in person twice during the dissertation process. Applicants must have a master's degree and a minimum 3.0 GPA. The university evaluates transfer credits on an individual basis. The Ph.D. in special education online program is not currently available to learners in California. The University of Toledo is regionally accredited by the Higher Learning Commission (HLC). West Virginia University ranks among The Best Online Special Education Doctorate Degree Programs! Based in Morgantown, WVU offers an online Ed.D. in special education that requires 74 credit hours. Students complete a dissertation, a comprehensive examination, and coursework in areas including policy, research, grant writing, and leadership. Applicants must have earned a bachelor's degree with a minimum 3.0 GPA and a master's degree in special or gifted education with a minimum 3.25 GPA. Applicants must also have a cumulative GRE score of at least 300 and at least two years of relevant professional experience. West Virginia University is regionally accredited by the Higher Learning Commission (HLC). The program holds national accreditation from the National Council for Accreditation of Teacher Education and meets the standards defined by the Council for Exceptional Children. As with any other online program, online doctoral programs in special education differ between schools. An online program's curriculum and delivery method influence the material students learn, how they learn it, and how long it takes for them to earn their doctorate in special education online. Professional writing and grant writing: As many students who earn a Ph.D. in special education online will have to secure funding for their research, many programs offer a grant writing course to prepare them for that element of their professional lives. Grant writing is an essential skill for any professor or researcher. Quantitative or qualitative research methods: All doctorate-level programs will have extensive research requirements, and special education programs are no exception. As many special education graduates go on to work in academia -- an environment requiring original research -- programs provide students with tools and best practices for conducting research. Psychological foundations of learning: Knowing the science behind learning and understanding how exceptional students best learn are crucial to becoming a special education professional. This survey course provides students with a broad background in the history and methodology of educational psychology. Policy analysis and development: Aside from academia, policy and advocacy are two of the most common fields for special education graduates. Doctoral-level special education courses often include a policy course that helps students learn how to create, analyze, and advocate for policies related to special education. Dissertation: Each special education doctoral program requires some sort of capstone or concluding project. The most common requirement is a dissertation, for which a student conducts original research, writes a paper, and then presents and defends it before a faculty panel. How Long Does It Take to Get an Online Doctorate in Special Education? Delivery method influences completion time for online doctorates in special education. Programs that deliver coursework synchronously often entail concrete timelines compared to programs delivering coursework asynchronously. Additionally, programs running on a cohort model may take longer than degrees that are individually paced. On average, students completing Ph.D.s in special education online and online Ed.D.s in special education must complete between 60 and 70 credits. Most programs are part time, catering to working professionals and taking between three and five years to complete, with the dissertation making up the majority of each student's final year. Attending an accredited school is important because accredited schools have passed repeated evaluations and quality checks by third parties. Colleges not accredited have either not undergone an evaluation or failed to live up to certain educational standards. There are two types of accreditation: regional and national. Only six organizations award regional accreditation, and they are split up based on geography. National accreditation often applies to for-profit, vocational, or field-specific schools. The Council for Exceptional Children (CEC) is the leading organization for special education teachers, professionals, and students. CEC lays out standards that inform the evaluation and creation of online doctoral programs in special education. CEC standards ensure students are prepared in the best possible manner for future special education jobs. There are two principal federal organizations that oversee the accreditation process. The U.S. Department of Education (ED) oversees all national matters related to public or national education, including accreditation and federal loans. The Council for Higher Education Accreditation (CHEA) is a separate organization that focuses exclusively on accreditation, recognizing over 60 accrediting organizations. Students can find a list of each organization's accredited schools on their respective website (CHEA and ED). The majority of graduates who hold a doctorate in special education enter academia as professors, publishing original research in special education and helping their students become special education teachers. However, some graduates decide to teach special education courses themselves, working in elementary, middle, and high schools. Still others use their content knowledge to influence or advocate for educational policy. Below, we spotlight five popular careers in the field. Special Education Teachers: Though most students with a doctorate in special education teach other future teachers, having your own classroom is still an option. Special education teachers work in elementary, middle, or high schools, preparing and delivering lessons and grading assignments. An advanced degree leads to a higher salary in this position. High School Teachers: Some special education professions also teach classes in a given content area. Special education graduates who want to teach another subject will have to get an additional certification; however, having an advanced degree as a high school teacher leads to a higher salary. Instructional Coordinators: Instructional coordinators oversee other teachers, creating curricula in addition to helping other teachers get better at their craft. Though a doctorate is a huge asset, many instructional coordinators must also have professional experience in teaching or administration. School Principals: School principals oversee and manage all operations for an elementary, middle, or high school. While school leadership is not a field that special education professionals study in doctoral programs, a doctoral degree is often a prerequisite for a principal, and special education professionals can often follow a trajectory from teacher to instructional coordinator to administrator. Aside from individual workplace differences, an employee's level of professional experience always influences salary. Nevertheless, having a doctorate in special education is almost always a boon for graduates' incomes. Below, we provide data from PayScale that shows expected salaries for different special education professionals at different points in their careers. Some of these positions require doctoral degrees, while others do not. Those that favor doctorate degrees -- professor, principal, and assistant principal -- are all higher-earning careers. Especially in a field like education -- in which techniques and methodologies are always changing and professionals are always creating new research -- professional organizations can help you stay on top of best practices. In addition, many professional organizations in the special education field offer professional development and annual conferences, which are great for networking and new job possibilities. Below, we highlight three of the field's most important organizations. Council for Exceptional Children (CEC): Aside from creating standards for collegiate special education programs, CEC provides professional development opportunities, access to publications, and opportunities to get involved with policy and advocacy. National Association of Special Education Teachers (NASET): Likely the most important organization for special education teachers, NASET offers conferences, professional development, training, policy and advocacy opportunities, and access to the latest research. National Organization on Disability (NOD): NOD advocates for more disabled employees throughout the United States. Special education professionals who are either involved with policy and advocacy or teaching students who will have to deal with employment barriers in the future would do well to investigate NOD. Distance learners in special education doctorate programs have many options to reduce or even eliminate their tuition. All students should be sure to fill out a Free Application for Federal Student Aid (FAFSA), which determines eligibility for many forms of financial aid. Students who get certain types of loans and grants from the federal government can actually earn loan forgiveness by committing to teaching a high-need subject area for a certain amount of time. Students interested in teaching special education in elementary, middle, or high schools after they earn their doctorate should consider taking advantage of this loan forgiveness program. They can accomplish this by researching which states have a high need for special education teachers. Though graduate assistantships and funding for research are more common for on-campus Ph.D. students, distance learners should still investigate whether or not they can get an assistantship from their program. There are also many field-specific scholarships available to students studying special education. These include both school-specific and third-party scholarships. Fortunately, several online programs either allow out-of-state online students to pay in-state tuition or offer a discounted per-credit rate for distance learners. Students should determine whether or not their program offers one of these two discounts.